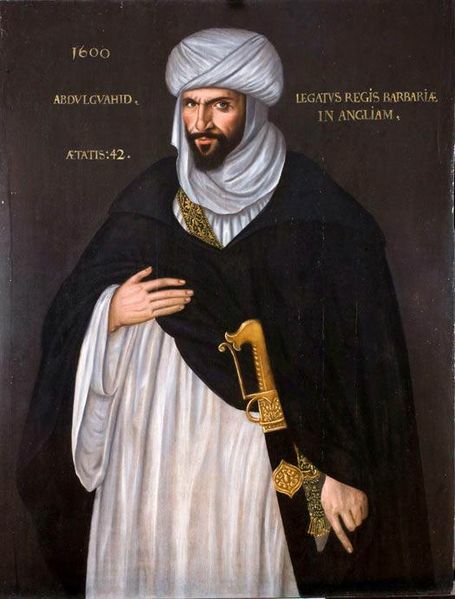 Moorish Ambassador to Elizabeth I – Abd el-Ouahed ben Messaoud – Muslim Museum UK – Uncover the 1400 year relationship between Britain and Islam. Explore the history and heritage of Muslims in Britain. 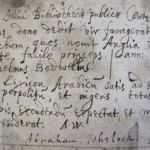 Abd el-Ouahed ben Messaoud ben Mohammed Anoun (b 1558) was principal secretary to the Moroccan ruler Mulay Ahmad al-Mansur, and ambassador to the court of Queen Elizabeth I of England in 1600. Following the establishment of the English Barbary Company in 1585, diplomatic relations and an alliance were established between Elizabeth and the Barbary states. Abd el-Ouahed ben Messaoud was accompanied by al Haji Messa and al Haji Bahanet, as well as an interpreter named Abd el-Dodar. They sailed on board The Eagle under Robert Kitchen, reaching Dover on 8 August 1600. Abd el-Ouahed ben Messaoud spent 6 months at the court of Queen Elizabeth and he met with the Queen on 19 August and again on 10 September. Discussions however remained inconclusive, as both rulers died within two years of the embassy. 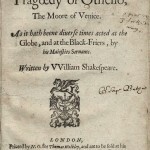 It has been suggested that Abd el-Ouahed ben Messaoud may have inspired the character of William Shakespeare’s Moorish hero Othello. Image © University of Birmingham, Research and Cultural Collections. The painting is available for viewing by appointment and is currently displayed at the Shakespeare Institute in Stratford Upon Avon which is part of the University of Birmingham.